There are many times that I have thoughts that come to defeat me. I want to end this series on condemnation by sharing how I have dealt with condemnation and overcome it. Every time that I am taunted with a thought that is contrary to the truth, I respond to that thought as Jesus did when He was led by the Spirit into the wilderness after a forty day fast. 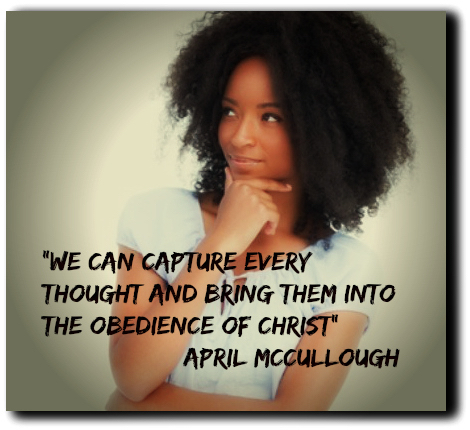 I let that thought know what God’s Word declares because every thought has to obey Christ. I remember when my husband traveled a lot and he would take the kids with him on the weekends. I didn’t think much about being left alone until I begin to have fearful thoughts. All of a sudden I was afraid that something would happen to me or my family and for some strange reason I was led to believe that if it did happen, that I deserved it. I was unaware that I had the authority to subdue those thoughts. My husband eventually stopped traveling and I would like to tell you that the thoughts stopped, but I continued to deal with this stubborn spirit. It took an intense season of renewing my mind in God’s Word and applying that Word to my heart and eventually to every thought before I was able to pull down those strongholds. It is still very much a process, but I am able to declare God’s Word now almost immediately and make every thought bow to the name of Jesus Christ. The key to bringing every thought captive is knowing God’s Word. In order to declare what is written, you must know what is written! Did you know that we have that kind of authority in Jesus Christ?? We can capture every thought and bring them into the obedience of Christ, and condemnation is no exception! We are more than conquerors through Jesus Christ that loved us. You can take every thought and put it into its proper place. Immerse yourself in God’s Word and whenever you feel guilt or shame or fear of any kind, just tell it where it belongs! It has to flee—that’s a promise from God!